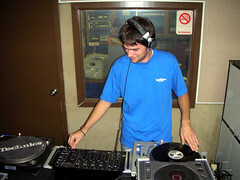 Enicma representing Deep Drums radio (every Tuesday 6-8PM PST on Leet Radio) drops in for his debut Future Breaks set. Expect an uplifting journey through techstep and leftfield Drum ‘n Bass. This entry was posted on Wednesday, November 23rd, 2005 at 3:01 am	and is filed under All Shows, Drum & Bass. You can follow any responses to this entry through the RSS 2.0 feed. You can leave a response, or trackback from your own site.